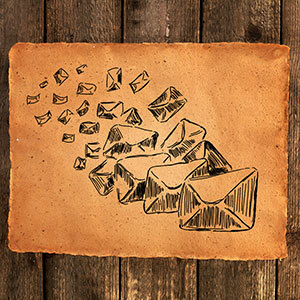 Email is a marketing method that should be treasured. It is a proven way to reach prospective customers and build long-term relationships with them. Email can significantly boost your visibility and, ultimately, your sales. The tricky part is ensuring you not only maintain the database you have, but grow it as well. Unfortunately, you can expect your email marketing database to slacken by around a quarter every single year. This is due to customers changing their contact details, changing companies, or simply removing themselves from your communications. It is your job to continue cultivating your email database in order to gain a healthy amount of growth within your business. If you don’t, you could find yourself preaching to a non-existent choir in a very short space of time. If your content is rubbish and even you get bored reading it, how can you expect anyone on your database to read it, let alone share it? Don’t get precious over your creations and look over what you’re distributing with a critical eye. If it’s not exceptional, change it now. It’s an important enough matter for you to spend some time making it right. Plenty of people make the mistake of creating an online obstacle course for visitors to work through before they are able to sign up for a mailing list. The first thing you need to do is take your techy hat off, and look objectively at how or where you are asking people to sign up to your mailing list. If it’s not something your Nana could do, it’s not right. Secondly, this is not something to be shy about. Don’t be afraid to boldly ask people to sign up to what you are offering. If you followed tip one, you should feel like you have something pretty amazing to offer, so offer it! Use a simple sign-up form on your website and your social media channels. All you need is an icon or image that visitors can click on to lead them to a simple form enabling them to subscribe. Ask a minimum amount of questions, so your customers don’t have to do a whole lot to be connected to your business. This does not involve anything untoward; rather, it involves you thinking inside the box, outside the box, and all around the box in order to collate email addresses. Run an online competition that requires entrants to provide their email address to enter. To gain even fresher contacts, you could run this through partner channels so that you’re connecting with a different selection of people. Use face to face events effectively. Running a stall or event to promote your business? Get people to sign up to the mailing list analogue style! Provide the ability to share. Include social share buttons on all your emails so that it’s easy for subscribers to pass your content on to others who might be interested. Vlog much? Ensure you’re including simple calls to action at the end of each video so you’re not wasting any impact potential. These are just a tiny selection of ways you can grow your email database. Essentially, it doesn’t necessarily matter how you do it, as long as you are seeking to do it in the first place. Your email database is not an egg, just sitting on it will not help it grow. Don’t let it wither and die – start taking action today!